Anyone in the mood for fire safety? Get to the point about fire safety fast with fun pencils that change colors with the heat from your hands! These "mood" pencils feature Sparky®, making them ideal for pairing with the Sparky® Stuff to Do Booklet, Sparky's® Activity Book, and other terrific Fire Prevention Week™ materials. 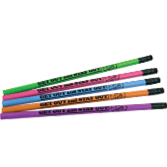 Color-Changing Mood Pencils are an economical giveaway for schools, community events, sports events, in the fire station, and everywhere you're attending a community outreach activity or event.